Whether it’s the high cost of insulin or the question of when to start combination therapy, the new issue of Evidence-Based Diabetes Management, a publication of The American Journal of Managed Care, covers up-to-the-minute topics in this special issue on therapeutics. Editor-in-chief Robert A. Gabbay, MD, PhD, FACP, leads off this issue featuring voices of providers, pharmaceutical leaders, payers, and patients. 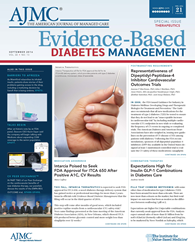 The new issue of Evidence-Based Diabetes Management covers issues in therapeutics. As our colleagues who treat cancer and rare diseases have understood for years, nobody's completely guilty, but nobody's completely innocent either, which makes solutions [for insulin prices] challenging. Questions that have experts in other diseases for years are reaching stakeholders in one of the fastest growing conditions on the planet—diabetes. In its new issue, Evidence-Based Diabetes Management addresses the promise and challenges of new therapies for a condition that affects more than 29 million people in the United States. Editor-in-chief Robert A. Gabbay, MD, PhD, FACP, the chief medical officer of Joslin Diabetes Center starts the discussion with his commentary on one of the hottest topics in diabetes care: the skyrocketing cost of insulin. Gabbay makes the point raised throughout the issue—patients see possibilities galore in new treatment, but with high prices or gaps in coverage, there’s no access. “As our colleagues who treat cancer and rare diseases have understood for years, nobody’s completely guilty, but nobody’s completely innocent either, which makes solutions challenging,” Gabbay says. A must-read commentary by Professor Emeritus R. Keith Campbell, MBA, BPharm, CDE, on the clinical benefits of Afrezza, the inhaled insulin from MannKind. A companion piece features accounts from patients who, despite outstanding early results, have had trouble getting payer coverage or even prescriptions. An original analysis that asks whether the populations included in cardiovascular outcomes trials of DPP-4 inhibitors are representative of the type 2 diabetes population. An account of high expectations for competing combinations of insulin and GLP-1 receptor agonists, one of which is developed by Sanofi and Novo Nordisk. Both products received advisory panel approval in the spring, but the FDA delayed final action until late fall. Coverage of recent Peer Exchanges, in which experts discussed new cardiovascular outcomes research on empagliflozin, and the opportunities for more patients with diabetic macular edema to benefit from modern therapies. The American Journal of Managed Care is the leading peer-reviewed journal dedicated to issues in managed care. AJMC.com distributes healthcare news to leading stakeholders across a variety of platforms. Other titles in the franchise include The American Journal of Accountable Care, which publishes research and commentary on innovative healthcare delivery models facilitated by the 2010 Affordable Care Act. AJMC’s Evidence-Based series brings together stakeholder views from payers, providers, policymakers and pharmaceutical leaders in oncology and diabetes management. To order reprints of articles appearing in AJMC publications, please call (609) 716-7777, x 131.